might argue that it’s hardly Dawn’s bumcrack, I consider having to be anywhere on a Saturday before noon barbaric. The neighbor drives a school bus, in case you’ve forgotten, and with the warm weather deserting us, she is revving that yellow beast up at earlier and earlier hours. Most weekday mornings find us jarred from our short-sleeped slumbers 30 minutes or more before our own alarms sound off. The weekends, in my opinion, should be about snuggling in until it’s officially daylight at the earliest and even that is a bit too uncivilized for my aging tastes. Cold weather has caught me unprepared. My winter coat is still in the basement closet and I am out of practice with the whole “warming up the vehicle” routine. 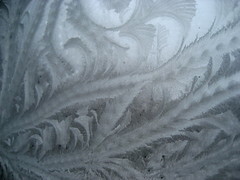 When Dee and I made for the truck, it was cold and frosty. And I had no idea where the ice scraper was. “What are you doing?” Rob was at the door watching me incredulously as I attempted to scrape frost off the passenger side windows with a Starbuck’s napkin and my fingernails. “I forgot to warm up the truck and I have no idea where the scraper is,” I thought that was a reasonable reply. He came out in his robe, liberated the scraper from a side compartment and shooed me into the truck as he proceeded to clear the windows of Jack Frost’s handiwork. “Your mom is silly,” he told Dee as he kissed her good-bye and gave me the “I can’t believe you sometimes” look when he kissed me. Practice is done. I managed to stay upright and wrangle a few groceries while Dee continued her march to someday dominating at the World Cup and we were home. I’d phoned Rob to check on his plans to run into the city while we were out, but he’d decided to wait for us. I love outings. Rob’s idea of outings typically involve a lot of driving with Clark Griswold-ish stops at various home handyman fave spots, but as I seldom make it farther from home than grocery or yoga class – I am easy to please. But after we entered the house, Rob crooks his finger and asks me to come upstairs with him. He needs to show me something. The last time he was “worried” he thought I’d been putting tea bags in the paper recycling and it was actually him that did that. I reached the bedroom and he showed me one of his white socks and one of Dee’s leggings. It took a minute but I remembered that months ago, Dee had rolled her legging together with her Dad’s sock as a joke. The girl child lay on her bed cackling and Rob looked relieved and a bit chagrined. *Still blogging for NaBloPoMo, catch today’s here and this is the last time I am linking to the Top 25 Canadian Mom Blogs list contest though the contest will continue on without further notice from me. I.D. It works very well and scraps nicely. That is what I use.